Dr. Andrea Nicola has helped hundreds of patients achieve improved oral health and attractive smiles. She has achieved a level of formal education, specialized training, and experience that few dentists will match.Dr. Nicola’s advice to any potential new patients is to, first and foremost, find a dentist you trust. Find a dentist that listens to your concerns and offers options to your treatment needs. Seek out a dentist that will give you a detailed explanation of any problems that are found and, any recommended treatment. Dr. Andrea Nicola is a general dentist. She graduated New York University at the top of her class, with a Doctorate of Dental Surgery. She is a member of one of the most prestigious honorary dental societies: Omicron Kappa Upsilon. 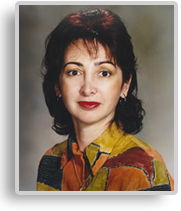 Dr. Nicola has always had a passion for learning and therefore has exceeded her state’s requirements for continuing education. Her continuing education includes the study of Orthodontics as well as Dental Implants. Her proficiency in all aspects of dentistry is one of the keys to her success. In addition she encourages her team to participate in as many dental courses as possible. The dental team has taken numerous courses in many dental subjects, including orthodontics and dental implants. Dr. Nicola’s professional affiliations include membership in the American Dental Association, Academy of General Dentistry and American Academy of Implant Dentistry, among others. She is actively involved in community service. Dr. Andrea Nicola grew up in Romania and is married to her husband Stefan; together they have one wonderful daughter. They enjoy doing outdoor activities as a family, including skiing, hiking, and water sports. She also enjoys reading and listening to classical music.